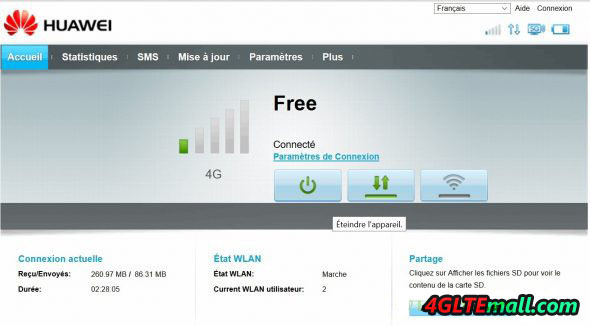 This article describes how to upgrade the Huawei E5786s-32a firmware to 21.297.03.00.309 firmware version. This update activates the Wi-Fi Extender function that is not implemented in the firmware of all E5786 routers, although it is mentioned in the technical specifications. The Wi-Fi Extender function allows the Huawei E5786 router to switch from the 4G network to a WiFi network available around so that you can access the WiFi network, in order to save your Data plan. 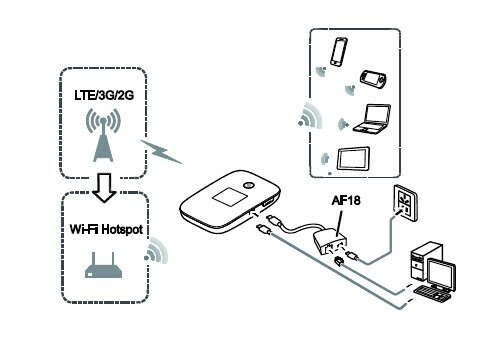 If the WiFi signal is lost, the router switches automatically to the data network. This operation is absolutely not supported by the manufacturer HUAWEI, in case of error during the operation of flashing of your firmware, you could make your router inoperative and totally out of service. At the slightest doubt or error message, do not continue the operation. On the other hand, by performing this operation, you lose all guarantees for your device, and any repair operation would be at your expense. We 4gltemall.com are not liable for any damages on your device if you carry out this operation which takes place at your own risk. The new firmware version essentially fixes security issues related to open-ssl. First of all, you have to install the HUAWEI drivers, for this we recommend installing the application “Mobile WiFi” whose sources are on the flash memory of the router. This application installs the appropriate drivers for a full USB connection. Use a good quality USB data cable to connect your router to your PC, we recommend that you use the one provided with the device. You should see a drive containing the application; we installed this application in version 1.12.00.309 on Windows 10 without difficulty. Once this application is installed, the firmware update program is able to communicate with the E5786 Router. When your router is detected after launching the program, the program may ask you for a flash code or flashcode in a small window that opens, be careful, it is not a network unlock code, but a code that allows the firmware to be updated. To obtain the code of flashing, it is necessary to identify the IMEI number of your device, it is generally written on the box and the body label of the device. We can give you the flashing code, this operation is absolutely free. In the following procedure, simply adapt the text according to the firmware and UI versions you are using. Start by running the firmware update 21.303.07.00.00. Make sure your PC is properly charged if you are using a laptop, and that your E5786 is also fully charged so you do not risk a battery failure during the software update. And the update process would not be suspended. We recommend that you disconnect the network connection of the PC you are using and then disable your antivirus to avoid interference with the flash. Then start the program Huawei_E5786_Update_21.303.07.00.00.exe right click “run as administrator” under Windows. A dialog box starts by scanning the USB ports of the PC looking for the device, if it does not find it; make sure that your drivers are properly installed. It is during this phase that the program is likely to ask you for the code of “flashing”. Your device will restart, in principle your settings are retained, but you will have to re-enter the PIN code of the SIM card. Select the program 2_Update_WEBUI_17.100.09.03.03_NE5.exe right click “run as administrator” under Windows. The sequence is identical to the previous phase, but you will not be prompted for the flash code. After updating the 2 elements, your interface offers several languages; choose the one that suits you. And you will see the new home page. In the new home page, you can see a WiFi Extender button at the right side of the ON/OFF and DATA buttons. In the settings you will now see a “WIFI Extender” column. This Wi-Fi Extender menu allows you to select a WiFi network and enter the security key. The priority menu is used to define whether the router should automatically connect to the WiFi network. Please note that now you will also find the Wi-Fi Extender menu in the Hilink app on Android or IOS as well as in the internal menu of the router.